Make your MacBook even classier. Nobody wants the beautiful aluminum body of their MacBook scuffed or scratched. Fortunately, MacBook cases and sleeves are to the rescue. They’re a great way to keep your MacBook protected, store it for traveling, or just look classy when you’re carrying your computer around the office. But there are an overwhelming number of cases and sleeves for the MacBook, MacBook Air, and MacBook Pro. It can be hard to tell which are good quality and worth the money. So Macworld is getting hands-on with some of the best-known brands as well as more eclectic designers to pick out the best cases for Apple’s line of MacBooks, both new and old models. Watch this space as we’ll be keeping it updated with our favorites. Because they’re always wrapped around a MacBook, hardshell cases offer the most security. You can count on these cases to protect your MacBook from unfortunate drops. Highlights: The Snap Jacket is one very cool case. It fits the MacBook like a glove, and acts like a kind of riser that slightly tilts the screen toward you when the laptop is open. But when closed, it protects the MacBook from every side. The edges are made from a hardshell plastic while the rest is a foam-like material. One thing though: It’ll block Apple’s USB-C hub attachment if you’re using that, but it’s just fine with a dongle. The Snap Jacket is available from Incase’s website and includes standard shipping and a 1-year warranty. 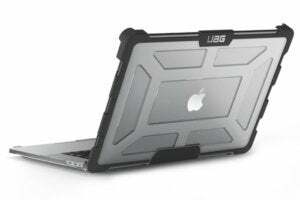 Highlights: With the UAG Plasma, you’ll look ready to take your MacBook into a combat zone. This ultra-rugged case from UAG guarantees military-grade drop protection, and it just feels and looks darn tough. Our favorite part about the Plasma is the rubber hinge at the back of the case that holds its two pieces together. This also works as a great textured grip to hold your MacBook while you’re walking around. The Plasma is available from UAG’s website and includes two-day shipping in the US. UAG also provides a 1-year warranty with this case. Highlights: Casetify has a wide range of artistic prints and is constantly adding more. Its clear, lightweight case snuggly snaps on the MacBook, while offering some drop and scratch protection. But where Casetify excels is the seemingly neverending designs you can choose from—so you’re bound to find something you like. Casetify offers free shipping worldwide on orders $35 and up. The MacBook case also comes in a classy white box with a linen bag. Highlights: Thule’s Vectros case is both sturdy and flexible. You can easily see how its two-layer bumper has ridges for shock absorption. It’s been 1-meter drop-tested, so you can count on it to protect your MacBook from drops slightly above 3 feet. But the coolest parts of the case might be its “scratch shields,” which protect the front and back surfaces of your device. The ruber bumpers also make for a great grip. The Thule Vectros is available from Amazon with free shipping. And you can find the listing for the older 2016 Retina MacBook Pros here. Highlights: Moshi’s iGlaze is an incredibly thin and light two-piece snap-on case available for all of Apple’s MacBooks. Despite being so thin and light, it easily protects from scratches and offers extra shielding for the unfortunate drop. It snaps on very easily thanks to its micro-clips, which also make it a breeze to remove for cleaning. And it really feels glaze-y to the touch because of its smooth surface. Moshi provides a 1-year limited warranty and includes 5 to 7 business day shipping in the United States. Sleeves provide protection while you’re carrying around your MacBook. They often also offer extra space for documents or cords. 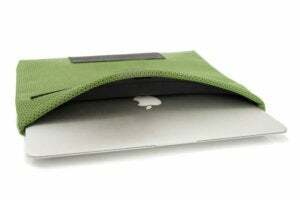 If you’re so inclined, you can even have a hardshell case and a sleeve for your MacBook. 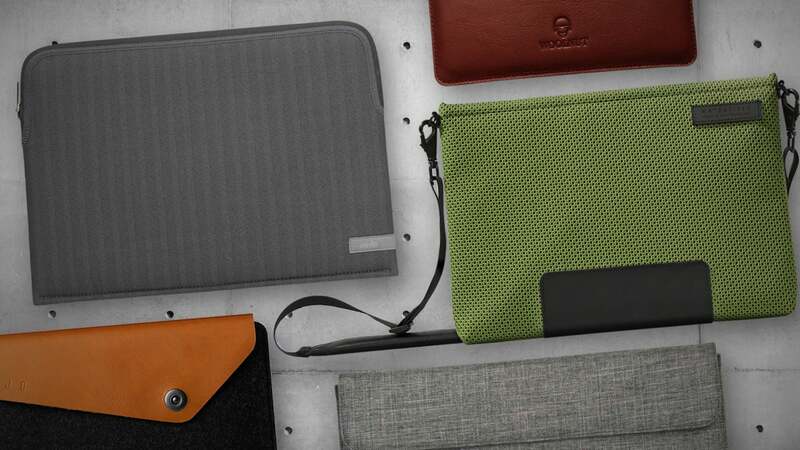 Highlights: WaterField is a San Francisco-based tech accessories and bag maker that actually makes its products in the city. The Maxwell is our favorite WaterField sleeve because of its thickness, ergonomic design, and magnetic sealing. The cross-stitch material the sleeve is made from feels durable, protective, and is also water-repellant. The leather patch that wraps around the bottom provides a nice gripping surface for carrying. And our favorite part is how after you slip your MacBook inside, the top of the case magnetically seals shut. For an additional fee, you can also add in d-rings ($5) and a strap ($22) so you can sling the case around on your shoulders. WaterField charges $2 for first-class shipping in the U.S. Highlights: If you want style on a budget, this sleeve is for you. Tomtoc’s Ultra Slim Envelop Sleeve is surprisingly well made for being less than $20, boasting a faux suede lining and “leather” made from polyurethane. The sleeve closes via four magnetic ringlets, which fasten tightly and won’t leave you worrying about your MacBook falling out. It even has a side folder for stashing your smartphone, papers, cords, or other small accessories. Tomtoc’s Ultra Slim Envelope Sleeve comes with a 1-year warranty covering defects. You can order the case via Amazon or Tomtoc’s website for the same price. 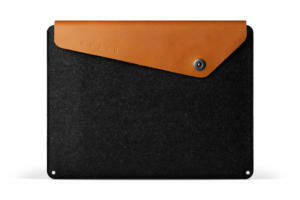 Highlights: Woolnut’s MacBook sleeve both looks and feels like pure class. 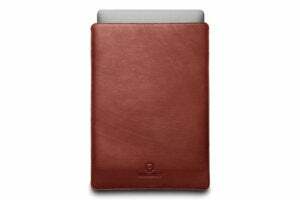 The Stockholm-based company’s full-grain vegetable tanned leather is top grade, and the sleeve’s interior is lined with 100 percent natural soft grey wool felt to give your MacBook the luxury treatment. Anybody who loves leather and wool will be in hog heaven. The sleeve is available from Amazon for $89 with free shipping, which is a better deal than buying the case directly from Woolnut’s website after you factor in shipping. 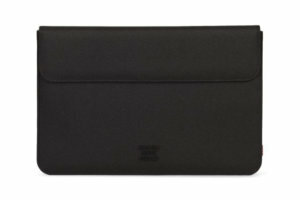 Highlights: Moshi’s Pluma sleeve may look simple and unassuming, but it’s packed with all the essentials you need in a MacBook sleeve. 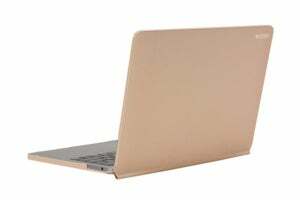 The sleeve is specially designed for the MacBook’s form, which is obvious when it zips up snugly. The case is made from three core materials: water-resistant polyester, neoprene, and spandex. The spandex and neoprene mix is slightly stretchy, offering shock absorption and some added durability. (It also just feels nice.) And we absolutely love how the zipper puller can be locked into place to prevent it from dangling. Sadly, this case is only available for the MacBook Pro 13-inch and other generic 13-inch laptops. Moshi offers a 1-year limited warranty and includes 5 to 7 day shipping in the U.S. The case also comes in a slightly roomier generic version for any 13-inch laptop. 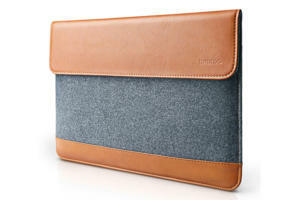 Highlights: This leather and felt case from Mujjo oozes modern executive realness. The felt provides a textured grip when in hand, or you can hold it by the leather flap at the top. It’s roomy, too. 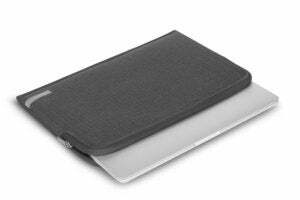 The sleeve has two compartments: One for the MacBook and another capable of holding an iPad at the same time. Our only complaint is that the case could benefit from a magnetic clasp instead of its ringlet button. 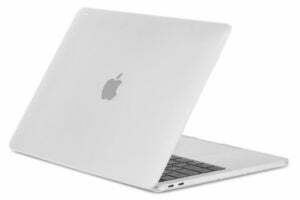 The case is available from Amazon in both a 13-inch and 15-inch version, with shipping included in the United States. Highlights: This sleek saffiano leather Tech Clutch from Casetify comes in a seemingly countless number of graphic prints. 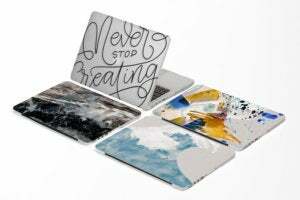 There are three different sizes to choose from: small, medium, and large, the latter of which is 13.98-inches wide and nicely holds either a 12-inch MacBook or 13-inch MacBook Pro or MacBook Air. It’s simple but elegant, and the colors pop beautifully from the leather. Speaking of leather, it’s thick enough to protect a laptop from scratches, light drops, and splashes. And its interior sports a cardholder and is lined with lux suede. 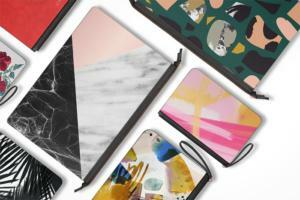 It might not be the most protective or high-tech MacBook sleeve available, but the cool prints make these clutches excel in the design department. Casetify only provides a 6-month warranty; shipping is included on orders more than $35. Highlights: You’ve probably walked by someone wearing one of Herschel’s trendy backpacks. The company has plenty of other well-designed gear, too, including its Spokane Sleeve which nicely fits around a MacBook. Its design may be very simple, but you can liven it up by choosing from 11 different colors or even a camo or palm print. It doesn’t zip, but its flap shuts magnetically to hold the MacBook in tightly enough. The best part is how a sealskin-like fleece lines the interior of the case, dying to be stroked. The Spokane Sleeve comes with a limited lifetime warranty and the price includes economy shipping. Dieter is a staff writer covering consumer tech, apps, and services. Tweet your hate mail to @dieterholger.